This month we’re celebrating 15 years of Toasted Cheese. As we look back on some of our proudest moments from the past decade and a half, we invite you to do the same. Day to day, progress can sometimes be so slow, it feels like you’re not moving forward at all. Pausing and reflecting from time to time is a good way to not lose sight of the big picture. Make a list of 15 things you’ve accomplished writing-wise since January 2001. Big or small, anything you’re proud of can go on this list. If you have a writing buddy or group, this would be a great exercise for all of you to do and then share with each other. Celebrate your accomplishments. Write a blog post or share on social media. (When you hit a low point you can look back on your list to give yourself a boost.) Invest in your writing life. Get yourself some new writing supplies or that software you’ve been meaning to purchase (if you don’t have it yet, Scrivener is well worth the investment). Do something fun! Freshen up your writing space, go to dinner with your writing buddy and toast your successes, throw a party for yourself and your writing group. What’s next? Set 15 new short- or long-term writing goals. Tuck it away somewhere safe and revisit it in a decade or so to see how you did. Happy writing! Summer is my favorite time of year. For many of us it is a change-up in the daily patterns of our lives. Because there are fewer vehicles on the roads due to school breaks and vacation rotations in the office, the commute to work isn’t as long, so many of us can sleep in a little longer and arrive home a little sooner. Home life changes, too. The sandals and flip-flops come out of the closet. Summer food is back. It’s a time to BBQ and to enjoy an icy cold one while dinner cooks on the grill or at your favorite restaurant now that the patio and umbrellas are open for dining al fresco. Don’t forget to stop at the ice cream stand on the way home. Indeed, the day-to-day demands don’t seem so demanding when the sun is still shining at eight o’clock, leaving plenty of time in the day to squeeze in those extra activities that were not possible during the long winter months. It is so easy to drop off the radar and slip away because no one is looking. And there is no requirement or a sunny sign-up sheet in order to take part in the summer change-up. It’s a given. A gift. I personally get very excited beginning in June when I see my favorite indie bookstores and my local library have their summer reading lists posted on their doors and display boards. How many new novels can I squeeze in before September? Yet reading is not the only change-up in my summer lifestyle—my writing changes too. It seems to be a natural occurrence as it happens like clockwork every year. Maybe it’s the boost in serotonin levels in my brain from all the added sunshine or maybe it is an evocative reaction to the sights, the sounds, the summery smells resonating deep in my writer-being that I credit from spending extravagant amounts of time outside as opposed to the ocean of time spent inside last winter. Perhaps it is all of the above. Last summer, I was possessed with writing personal essays. I made a list and managed to get three nearly finished before September first. The summer before that I spent some time playing with narrative points of view. This summer, I’ve decided to change up my writing bucket list. 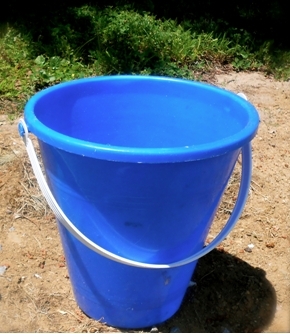 The last three bucket numbers are now re-ordered to Numbers 1, 2, and 3. My plans are to spend some time writing blog posts on a particular non-fiction subject, writing an old story in a different point of view, and perhaps writing one or two fresh pieces of flash fiction. Yes. I’m ambitious. And even though I may abandon my laptop to literally go fly a kite on the beach or go see a ball game, and may not return to my writing until the next day or the day after that, it is perfectly A-okay to do so. It is okay because if indeed the summer months take over my writing schedule, I know that anything I don’t finish will become fodder for the winter months—my winter writing bucket list. So writers, while the sun is shining consider a change-up in your writing. 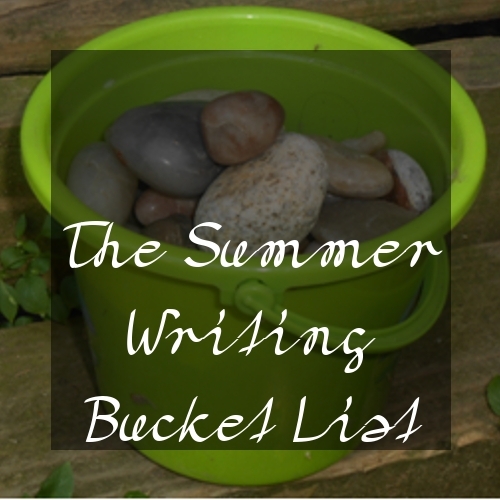 Write a list for your summer writing bucket and make it happen. Take out an old story and write back stories for your main and supporting characters. Write a story entirely in dialogue. Write a story in backward chronology. Write a story that happens in a 24-hour span. Rewrite a story in a different point-of-view: first, second, or third. Rewrite a story with a different narrator, style, or structure: Give an inanimate object or concept such as “joy” a voice. Try writing in stream-of-consciousness style or in epistolary format to tell your story. It worked for Mary Shelley, Bram Stoker, Charles Frazier and a host of writers. Give an old story a fresh coat of words: Rewrite it in a different verb tense. Try a present, past or future voice: I write all summer long. I wrote all summer long. I will write all summer long. I promise! Write in a different genre. Interview someone of interest in your community and pitch the interview to your local newspaper editor or local magazine editor. Hint: Retired veterans and school bus drivers have great stories to share and know a lot about the community. Create a cookbook anthology using your personal favorite recipes. Write about something you are an expert on. A how-to essay or what a particular activity means to you. If you have hobbies start there. Maybe you know how to build the perfect chicken coop or know some gardening secrets you can share. Visit the newsstands and see where your piece best fits. Write an article or book review for Toasted Cheese! It’s that special time of year when everyone inflicts self-guilt for not having done all the things they vowed to do a year ago: Learn another language. Perfect William Shatner impersonation (hairpiece optional). Finally have “The Talk” with parents. Make a steaming batch of matelote from scratch… well, I suppose everyone’s list is different. Wouldn’t it be nice to make some resolutions you can actually keep? Try some of these. Write every week. Things pop up in life and we can’t always keep a daily writing appointment. If you decide to do creative writing at least once per week, writing 1000 words per session, by this time next year you could have your first draft of a novel completed. If you intend to make a “write every day” resolution and/or a “start exercising” resolution, why not combine them? Write, then stretch and do some walking to get your circulation going. Do some biking and then write a little while you rest and drink some water. There’s no reason your resolutions should compete for your time. Set up an e-mail account just for your writing-related work. Use this e-mail address for all your submissions. Use it as part of your contact info. Create folders for “submissions” and “newsletters” and any other facet of your writing life. E-mail copies of your work to yourself (then everything’s stored “off site,” in case anything happens to your hard drive, disks, etc.). Please don’t include any form of “write” in the e-mail address (ex: “ZuzuWriter@gmail.com”); it can come across as hokey to an editor. Avoid weird and cutesy names too, like “snowbunny76” or “scarletsuccubus” or the like. Stick with something like your real name, like sarahjessicaparker or sjparker or sarahjess. Keep track of your submissions. More than once, Toasted Cheese has accepted a submission only to have the writer tell us “oops, I forgot to tell you it was accepted someplace else.” After weeding it out, reading, rereading, sending the personalized acceptance letter, it’s very frustrating and, for me, puts the writer on a mental blacklist. The best way to avoid this is to have that “writing only” e-mail account to keep your stuff together. Submit one story, article or poem for publication. You might get rejected. In fact, you’ll probably get rejected. Rejections are nothing to be ashamed of; we all have tons of them. A rejection says “I tried” and trying is better than doing nothing. Enter a writing contest. Yes, that’s right. Write for fun and profit! The profit may only be publication, but contests are fun and there are several no-fee writing contests in the writing world. Novel and Short Story Writers Market and Poets Market list all kinds of contests (including ours) so check them out and give one a try. Even if you don’t place in the contest, you have met a deadline and you have a completed story to submit elsewhere. Two goals in one! Try a writing workshop. You can do it online in your own time (like here at Toasted Cheese). You can find a workshop near you and drop in (or just linger and eavesdrop, like I do). Chain and local bookstores often host writer workshops in-store so ask an employee for a schedule or the group’s name. You can usually find groups and their schedules online. Check out Meetup.com and look for writing groups in your area (or reading groups—see #7). If there’s no writing group near you and you’d like to have a real-life workshop experience, try to start your own group. Read. If you are a writer, you should be a reader as well. Poetry books can teach us about word economy, metaphor and imagery. Novels and collections of short fiction can inspire us to do our own storytelling. Memoirs and biographies can teach us about character development, believability and entertainment value. You can also read online. Literary journals, newspapers, magazines and even classic literature can be found quite easily. Many folks have posted their NaNoWriMo novels online. Maybe you’ll discover tomorrow’s literary sensation today!